Child patients will be given priority in kidney transplants when there is a brain-dead or non-heart-beating donor under a new agreement on organ transplantation between three major hospitals in HCM City. Cho Ray Hospital, Thong Nhat Hospital and the Paediatrics Hospital No 2 on October 16 signed a two-year agreement to share organs donated by brain-dead and non-heart-beating people for transplants on child patients at Paediatrics Hospital No 2. 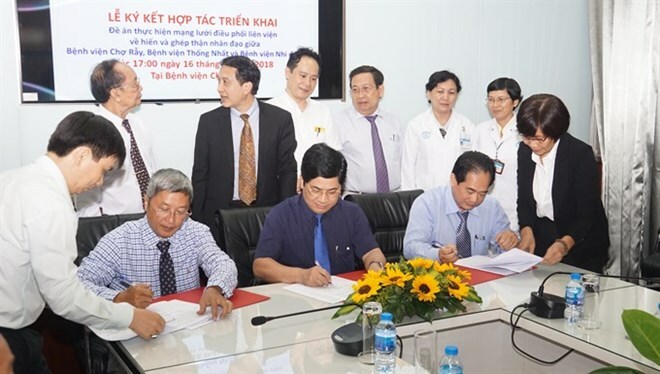 The agreement would help the allocation of donated organs to candidates on the waiting list in the most equitable manner and develop an organ transplant system at city hospitals, Nguyen Truong Son, Director of Cho Ray Hospital, said. Cho Ray performs dozens of organ transplants using organs from living donors and brain-dead and non-heart-beating people every year, he said. Trinh Huu Tung, Director of the Paediatrics Hospital No 2, said his hospital has done only 16 kidney transplants and 12 liver transplants in the past 14 years. He attributed this to the severe shortage of organ donations. Most organ donations are by relatives of patients, he explained. He hoped the co-operation would help more child patients get organs for transplant. Tran Dong A, a consultant at the Paediatrics Hospital No 2’s organ transplant unit, said the law prohibits the use of organs from brain-dead people below 18 years of age, resulting in limited organ donation. Trinh Hong Son, Director of the National Coordination Centre for Organ Transplantation, said the co-operation would help increase access to donated organs by people in need of life-saving transplants. There are 18 units for coordinating human organ transplants in the country and the number is expected to increase in future, he added./.